Do Bobble-heads Dream Spring Metal Sheep? 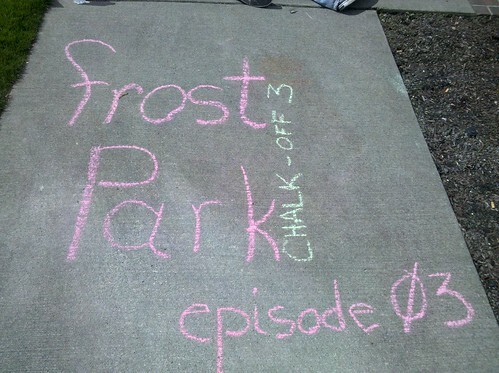 by KevinFreitas on 4/16/2010 @ 11:12am Beautiful day for chalking! Lo, I'll miss out though due to a client meeting in Bremerton. However, I'll throw in an obscure Rainier's baseball Ben B. Cheney bobble-head either as an add-on to 1st place or as a consolation prize. by Wings_of_Change on 4/16/2010 @ 11:28am See you down there!! by NineInchNachos on 4/16/2010 @ 1:01pm got some great photos. 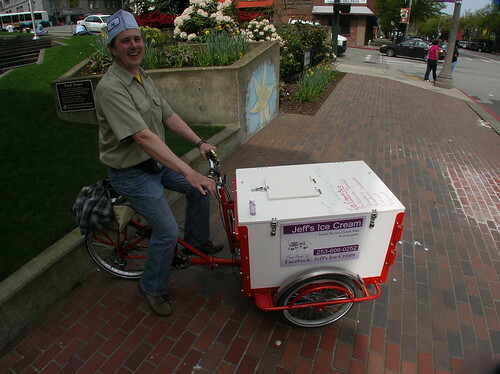 Also picked up a new sponsor for next week: gift card for Ice Cream served out of a bicycle! by Altered Chords on 4/16/2010 @ 2:42pm Voting has never been this difficult for me. 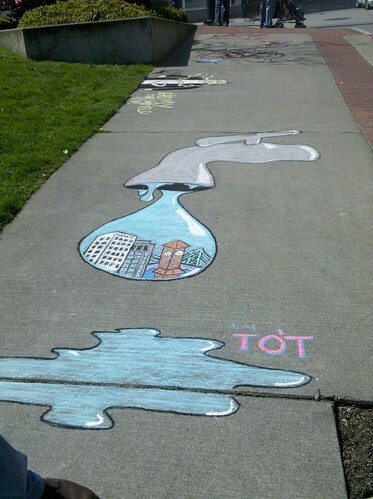 I vote for Thorax water drip of Tacoma. There seems to be more of a 3d effect this week or did a mushroom fall into my coffe cup as I walked past 9th & Commerce? by Earthdaughter on 4/16/2010 @ 2:44pm Wow! Way to make it hard to pick a favorite, guys! These are terrific! That being said, my vote is going to Thorax this week. Monlux is a close second! And I love those scuttley critters, Andrea. by NineInchNachos on 4/16/2010 @ 3:03pm I vote for Monlux! 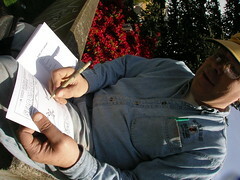 by ALT on 4/16/2010 @ 3:52pm I'll likely make a fool of myself again while I try to recall how to post pics in threads. 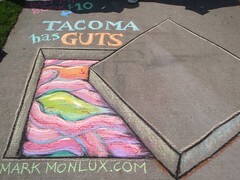 by Mark Monlux on 4/16/2010 @ 4:08pm A vote for "Tacoma has Guts" is a vote for Tacoma! 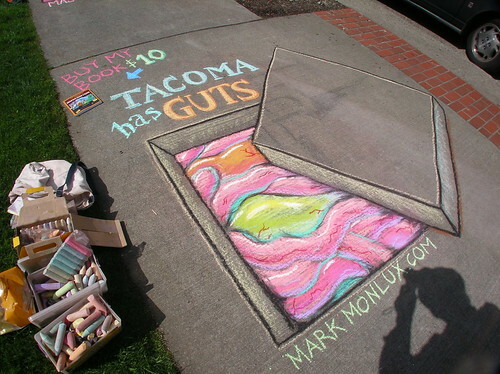 I vote for "Tacoma has Guts"
by ALT on 4/16/2010 @ 4:09pm Haven't yet decided who to vote for. 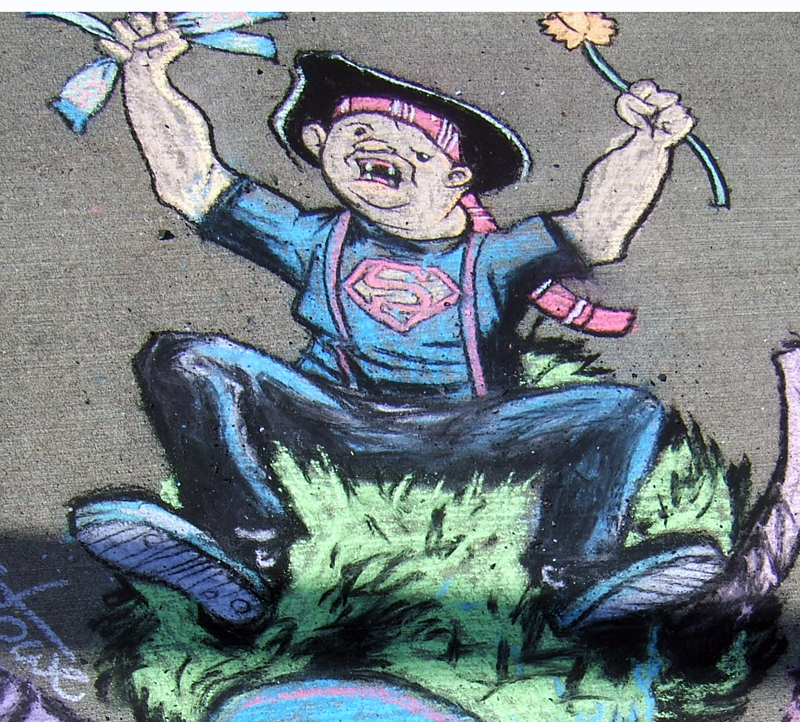 Right now I'm torn between Monlux's crafty 3-D drawing of Tacoma's guts and Stowe's awesome rendering of Sloth participating in the Daffodil Festival. 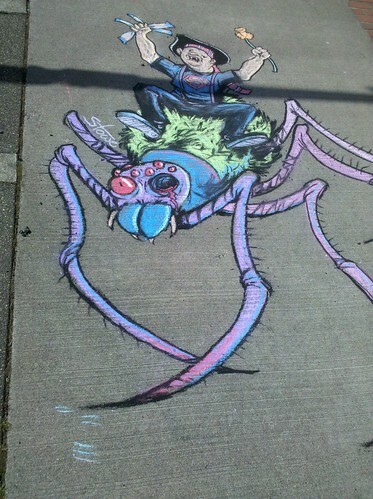 How did his spider steed lose an eye anyway? by thriceallamerican on 4/16/2010 @ 4:16pm Joel - I realize that the MLS logo is much less recognizable than the MLB one, but "Major League Chalker" would have been better wordplay. IMHO. 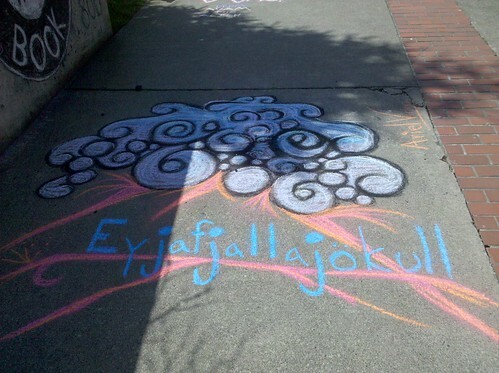 Lots of pretty pictures, but I'm an Icelandophile so Eyjafjallaj�kull by Ariel gets my vote. 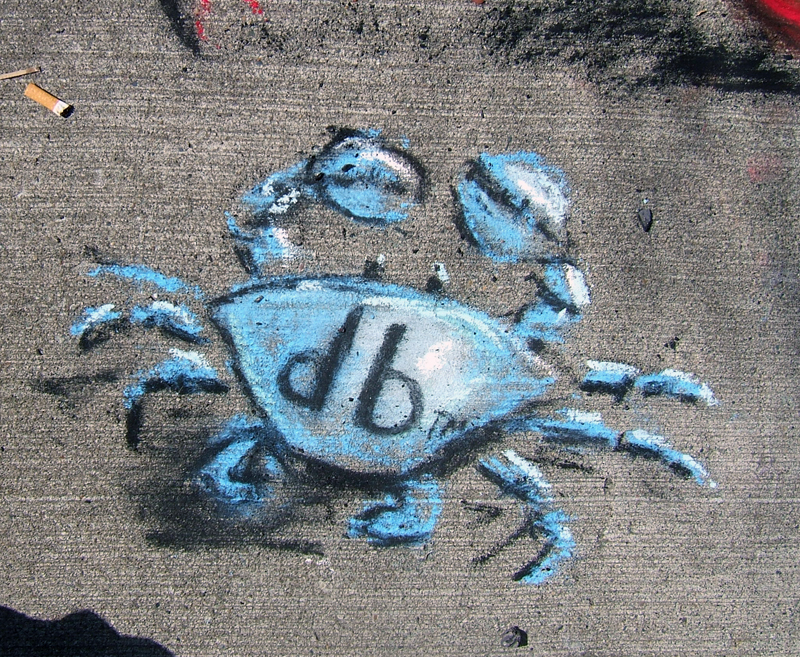 by NineInchNachos on 4/16/2010 @ 4:20pm OK I vote for Andrea's Crabs! by izenmania on 4/16/2010 @ 4:20pm @Thrice Joel's plan is to roll through a different (possibly sports-related) logo each week, Frostified, so there's still time for the MLS to make an appearance. 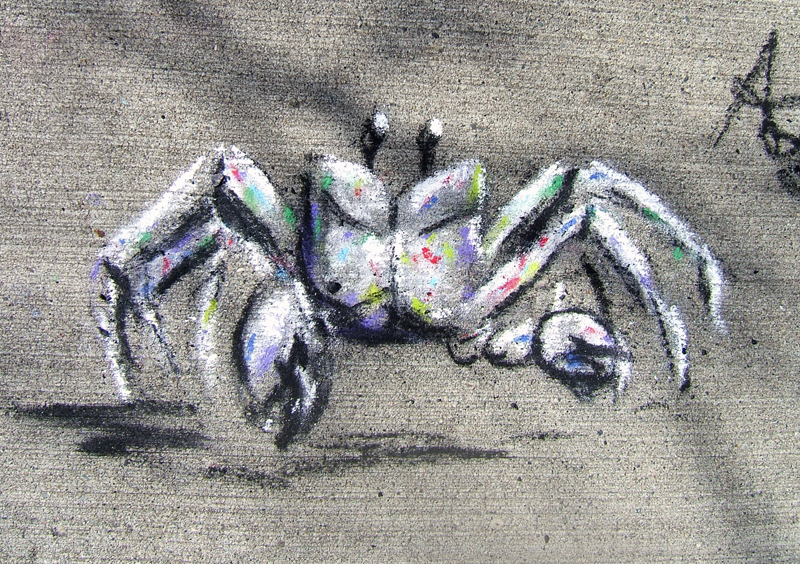 by izenmania on 4/16/2010 @ 4:21pm I vote crabs. by Mark Monlux on 4/16/2010 @ 4:22pm Here are the links to the photos I took today. 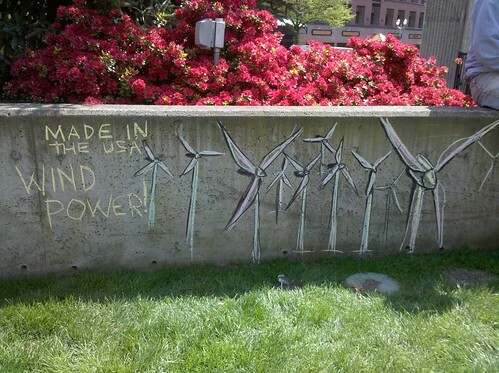 But I forgot to get RR's Windmills. Oh, and I've posted them to the Flickr group as well. by Courtney on 4/16/2010 @ 4:25pm Very tough this week to decide. I'm torn! I vote Mark Monlux though. by NineInchNachos on 4/16/2010 @ 4:59pm Has everyone purchased a book from Mark yet? Stowe...if Sloth had a TULIP i might've voted for ya. jk. I need to get out on Fridays more often! If you guys have other logos you'd like to suggest for Frostification let me hear 'em! Also thinking of it's easier to apologize than ask. I'm looking into MLC logos on t-shirts. by Joel 413 on 4/16/2010 @ 5:10pm Oh yeah. I VOTE for Major League Chalk... yes I'm self-serving this week. if the usual voters show up, I need all the help I can get. It's original, it's awesome, it so belongs on a t-shirt! by marumaruyopparai on 4/16/2010 @ 5:20pm Total feast for the eyeballs this week, just incredible stuff. by Mark Monlux on 4/16/2010 @ 5:26pm I really like this photo RR took. It shows off the viscousity I was aiming for. by marumaruyopparai on 4/16/2010 @ 5:26pm Maybe a rank choice voting system needs to be implemented here. 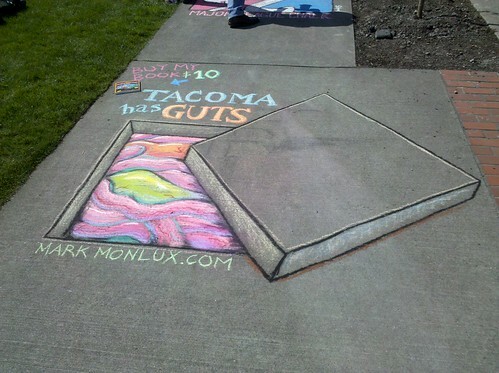 by jamesstoweart on 4/16/2010 @ 5:44pm I like Monlux's guts as well. Nice 3-D effect. I vote for Monlux. by ALT on 4/16/2010 @ 6:14pm Tough choices, but I'm casting my VOTE for Stowe. I love The Goonies! by shannnancy on 4/16/2010 @ 6:16pm So many pretty chalkings! 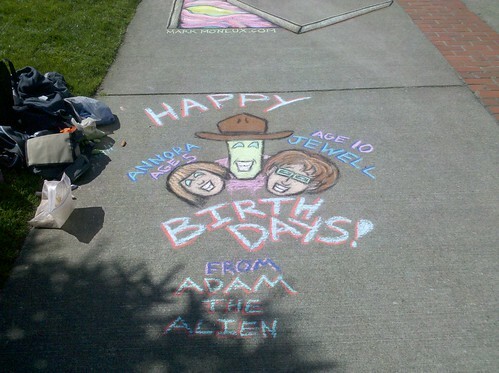 I vote for Adam's birthday wishes. by debivans on 4/16/2010 @ 6:21pm Decisions, decisions...My vote goes to TOT's drip. by Dianne on 4/16/2010 @ 6:40pm I vote for attack Garfield (Jeremy). by Crenshaw Sepulveda on 4/16/2010 @ 6:52pm Tacoma may have pushed Daniel Blue away but he still lives with us in the crabs he has given us. 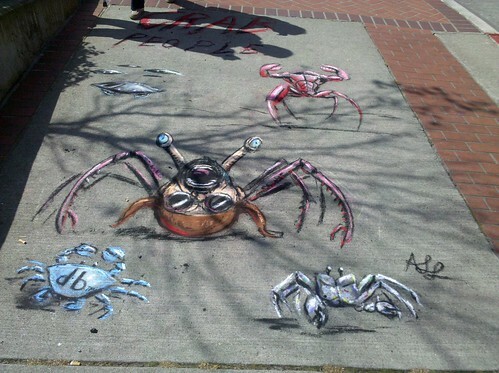 I vote for Andrea and the Tacoma Crustaceans . by NineInchNachos on 4/16/2010 @ 7:29pm I thought it was Gangsta Garfield? by smalltown on 4/16/2010 @ 9:20pm I have to VOTE for Stowe. He drew me a flower, how could I not? by JeremyScott on 4/16/2010 @ 9:30pm I vote for myself. by Mandiferous on 4/16/2010 @ 9:55pm Wow. Just... just wow. So much awesomeness going on. Gonna have to vote for Monlux. by Erik Hanberg on 4/16/2010 @ 10:08pm I'm casting mine for MONLUX. Clever and fun. by ZottePark on 4/16/2010 @ 10:15pm I vote for Adam The Alien! Excellent stuff! Happy Birthday Jewel! by crockawaddy on 4/16/2010 @ 10:16pm Tough choices this week. There is alot to like about each one. 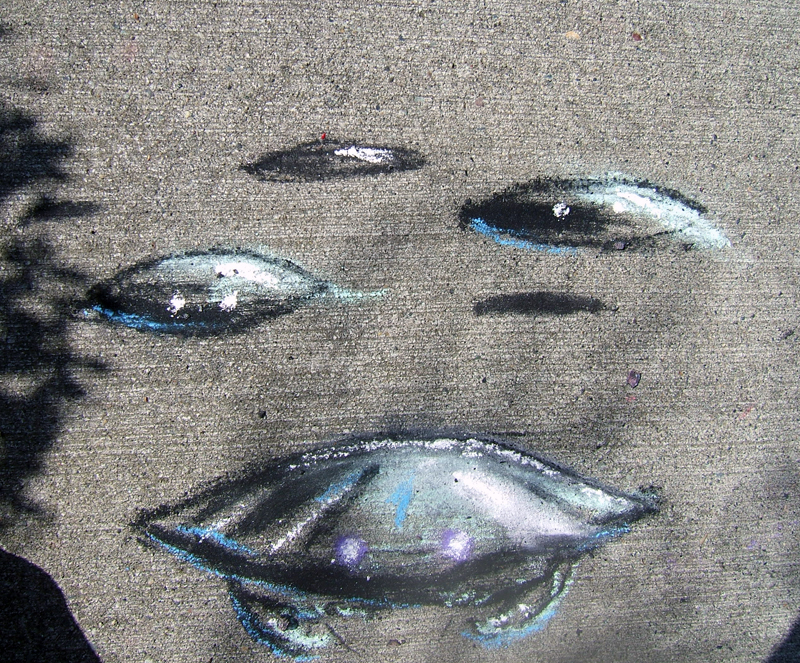 But, I must go with the sentimental one: I vote for Adam the Alien. by Adam the Alien on 4/16/2010 @ 10:22pm It really is a tough call. Ordinarily, Andrea's would be tempting, as it's well-rendered and feeds my ego. On the other hand, Stowe combines two pop culture references in an epic, unlikely crossover. I crew up on comics with epic, unlikely crossovers and loved them. And, of course, Thorax's Tacoma drip was very classically surreal. All the pieces were wonderful. But ultimately, I have a lonely bobblehead - of author John Green - who could really use some, uh..."company" in the form of that Princess Leia bobblehead. Therefore, I VOTE FOR MYSELF. Hey, I'm not the first one. by martha_s on 4/16/2010 @ 11:02pm I vote for Adam The Alien. 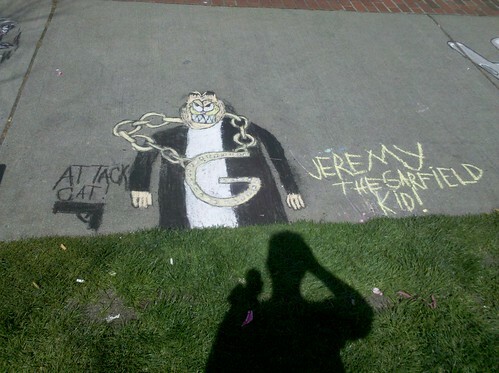 by JeremyScott on 4/16/2010 @ 11:12pm "Attack Garfield's" G stands for gangster Garfield. by Girl Who <3 JUNK on 4/16/2010 @ 11:30pm I VOTE Andrea! by NEAL on 4/16/2010 @ 11:35pm I vote adamthealien. 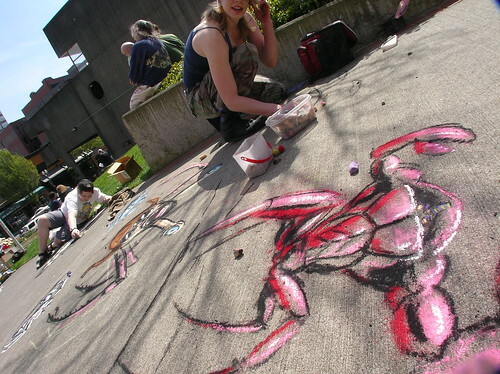 by Wings_of_Change on 4/16/2010 @ 11:56pm I love the crabs, and the guts of Tacoma are pretty amazing, but I'm gonna VOTE for myself. It was a lot of fun seeing everyone today! Cant wait for next week! by KevinFreitas on 4/16/2010 @ 11:58pm I vote Stowe! Really wonderful work out there today -- wish I could've been there. 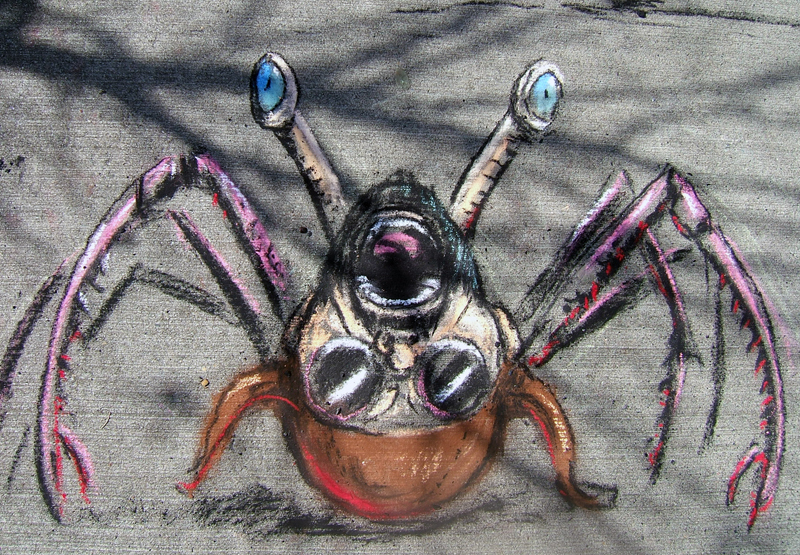 Huge fan of all the 3D stuff that seems all the rage with those Avatar-watching kids these days. 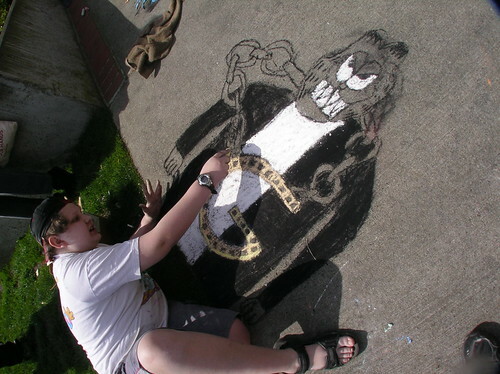 Great chalking all! by Erik on 4/16/2010 @ 11:59pm I vote Lupin Goddess. However, @tommyllew used the phrase "gotta go with" as opposed to vote for. If the rules are to be enforced, that would drop Mark Monlux's total down to 6 and Adam the Alien is the winner. @LivingRomanceXo voted this morning, which doesn't count. Votes must be in by midnight. 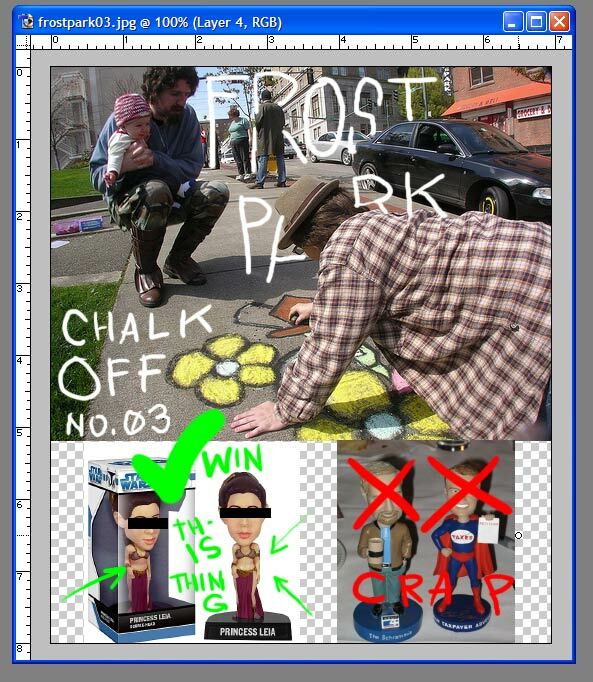 by Mark Monlux on 4/17/2010 @ 9:37am Adam, I will happily duel off with you next week (or in manly private) with the traditional Frost Park Chalk Challenge Rock-Paper-Scissors tie-breaker for the much coveted Princess Leia Bobble Head. Unless the 'judges' rull against @tommyflew's vote. In which case I will cry bitter tears of heartbreak. by Altered Chords on 4/17/2010 @ 10:02am OK - now that it's over make sure someone puts the concrete slab over the guts. If someone falls in there they'll sue the city. by ALT on 4/17/2010 @ 2:41pm Considering all the insanely fantastic entries this week, I never even thought I'd get as many votes as I did. RxR, Izenmania, Crenshaw, DumpsterDivingDiva, Erik - thanks for your votes! That was way closer than I thought it would be....and I'm still not sure who the winner is. by NineInchNachos on 4/17/2010 @ 7:16pm you were robbed Andrea. Robbed i say! 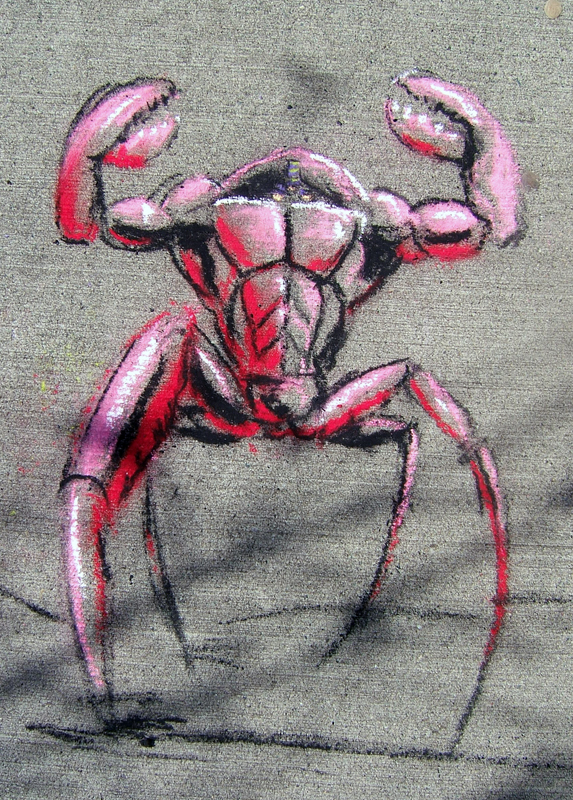 your crabs r the best.